Visible Learningplus professional learning translates the groundbreaking Visible Learning research by Professor John Hattie into a practical model of inquiry and evaluation. Rather than a one-day workshop or a one-size-fits-all solution to school success, however, the Visible Learningplus School Impact Process is an evidence-based schoolwide system improvement process that takes place over several years and provides the clarity you need to focus on the practices that have the highest impact on student achievement. Find out more about Visible Learningplus professional learning services below. To bring Visible Learning to your school and start your Visible Learning Journey, please submit your request here. Designed to enhance the capability of school leaders and teachers, the Visible Learningplus School Impact Process combines the workshop components of the Foundation Series and Insides Series with Evidence-Gathering Tools and Impact Coaching to provide a long-term, sustainable solution to improve student learning and increase schoolwide achievement. The first component of the School Impact Process is the Foundation Series. During this series of workshops, teachers and leaders are introduced to tools for gathering evidence in their schools and classrooms and create a plan for making learning visible for all students. Build a foundation across schools. Participants will discuss the most important messages from the Visible Learning research and understand what does—and doesn't—make a significant difference to student achievement. Learn what evidence you should collect to know if you are a Visible Learning school. Participants in this one-day seminar will receive tools and processes for gathering data. Participants analyse their gathered evidence to determine school priorities and targets and to develop an action plan for making learning visible. Teachers will gather and examine evidence on what is occurring in their classroom, with a focus on understanding the characteristics of visible learners and measuring their impact on students. 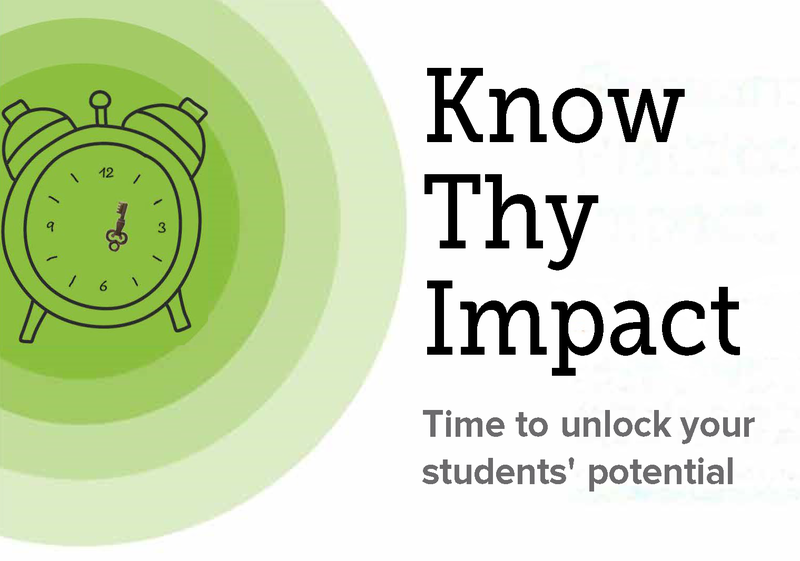 What can data tell us about our impact on student learning? In part II, teachers will analyze and share their evidence and create an action plan for moving forward. The Inside Series is the second component of the School Impact Process. This series allows educators to delve deeply into a specific area of need or take the next step after the Foundation Series in the School Impact Process. Our team of consultants will help you master the practices that create the biggest gains in achievement for students by focusing on your areas of greatest need. Turn students into visible learners. Where am I going? How am I going? Where to next? These questions are the foundation for developing assessment-capable visible learners. Give and receive effective feedback. The Visible Learning research tells us that feedback has a big impact on student achievement. This seminar focuses on effective types of feedback and ways to provide effective feedback to your students. Analyse and act on data. How does data inform decision making? In this seminar, you will learn how to calculate effect sizes and interpret evidence to show impact. There are many ways to collect information about what students know and can do. Learn how to create effective pre- and post-tests using the taxonomy of your choice as the framework for effective and reliable design. Learn more about what mindframes for impact look like and sound like in action. This workshop provides you with the tools and resources to evaluate and monitor the mindframes of teachers and students you work with. Understand the science of learning. During this workshop, you will learn about the newest research about the science of how we learn, conducted by John Hattie and colleagues from Melbourne University Education. The process for collecting and analyzing evidence from your own context is what lies at the heart of Visible Learning. This is why Evidence Gathering Tools are the third component of the School Impact Process. Throughout your Visible Learning journey your school will learn to use various assessment tools to identify key areas of improvement. Initital baseline data is gathered against which progress can be measured. Then, working in collaboration with a certified Visible Learningplus consultant, schools and districts will use the results from capability assessments to identify the key elements to focus on during ongoing professional learning. The School Matrix is used to collect school-level information about the processes, beliefs, and practices that are in place across the school.The School Matrix is included with the Foundation Series. The Classroom Observation Tool is a peer-led classroom observation tool that provides a framework for teachers to learn about their classroom practices and student learning over the course of three fifteen-minute observations. The Classroom Observation Tool is included with Impact Coaching. The Mindframes Survey represents the ten mindframes (attitudes and dispositions) that are integral to understanding the set of beliefs that teachers and school leaders have towards the impact of their practice. These beliefs and attitudes are correlated to improved student outcomes. Consultants conduct half-day site visits at least once per year to collect and analyse baseline capability data. It is the very first thing your school should do when embarking on your Visible Learning journey. Impact Coaches are critical to the successful implementation of Visible Learningplus. The Impact Coach’s role is one of building school and system capability, ensuring effective changes are implemented within schools, supporting longer-term sustainability, and ensuring rigorous and ongoing evaluation. Impact Coaches support school leaders and classroom teachers as they collect and analyse evidence and implement Visible Learning practices. Visible Learningplus consultants will train and support Impact Coaches through seminars, observation, and one-on-one coaching. Below are the sessions used to train Impact Coaches to support your school's Visible Learning journey. Establish and implement action plans. Impact Coaches will begin by building a strong foundation of knowledge and understanding of John Hattie’s research and the principles of Visible Learning and teaching. They will then learn to work collaboratively with school and system leaders in order to establish and implement plans to collect, collate, and analyze evidence to inform the school’s Visible Learning action plan. During their second Impact Coach seminar, Impact Coaches will establish Visible Learning action plans focused on building the internal capacity of the schools to improve student achievement. They will learn to provide professional learning, advice, and support to leaders and teachers and guide the implementation of Visible Learning plans, including regular monitoring, reviewing, and reporting on impact to identify key areas of need. In their last Impact Coach seminar, Impact Coaches will review the results of evaluation and monitoring with the Visible Learning team and work collaboratively with leadership to ensure that Visible Learning practices are in place. They will learn to provide ongoing feedback and professional development to school staff, use the Classroom Observation Tool (COT) and train leaders in the use of the tool, and support change moving forward by establishing a cycle of evidence-gathering. © Visible Learning Plus, all rights reserved.